Ventev Innovations Dual Output Vehicle Power Adapter with USB port is a high performing, well-designed car cell phone charger with valuable and innovative features to give you and your mobile phone the best charging experience. The dual output vehicle power adapter (VPA) allows you to simultaneously charge your phone while you juice up your iPod or Bluetooth headset. 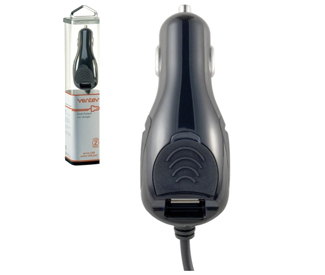 With its iPhone charging platform and capacity to support two devices at once, this Ventev Innovations cell phone car charger offers the utmost in convenience. An ergonomic shape, comfort side-grips, and a glow-through blue LED make this VPA a smart choice for both performance and style.